I have been invited to 4 weddings over the next few weeks,�unfortunately�I wont be able to attend all of them as I will be away. My�initial�excitement about a good piss-up at a wedding was dampened when I reaslied there probably wouldnt be any alcohol whatsoever. 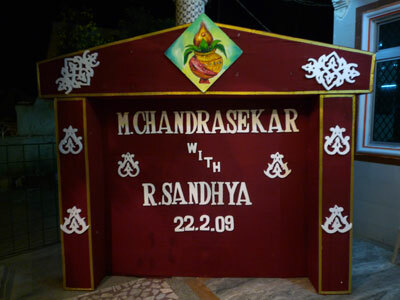 Sandhya’s wedding ceremony started at 7am, but I arrived�fashionably�late at 8.30am. Not only was I the only Westerner in the Temple – I suspect a probably 5 mile radius. 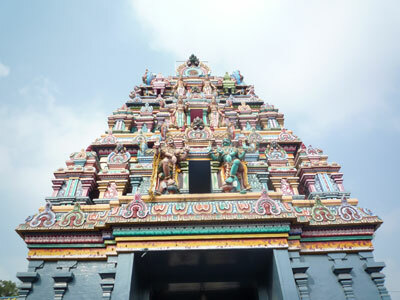 Unlike English weddings, there are multiple weddings all at once in different areas of the temple. Guests sit around the bride and groom as music is played, prayers said, mantras chanted and a lucky coconut passed around. Instead of placing a ring on a finger, it is placed on a toe. Eager to get some good photos I squeezed my way to the front, only to feel the hot glare of the video camera on me and then notice that everyones attention (and indeed cameras) had turned from the ceremony to me! So Slum Dog Millionaire cleaned up at the Oscars, which was celebrated all over India and particularly in Chennai as the music director lives here. I bought tickets for the whole company to go and see the film a few weeks ago, but fell ill so although I have bought it on DVD I still havent seen it! 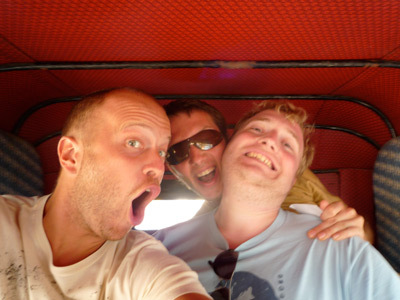 I don’t have a driving�License�in the UK – but the process for obtaining one in India is far simpler. 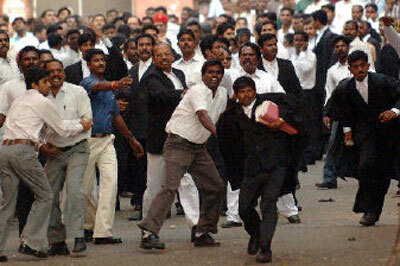 The story which has dominated the news this week has been the rioting between lawyers and police at Madras High Court. Leader of the political Janata party insulted a Lawyer on ‘caste lines’. Colleagues demand his arrest, which erupts into violence. 122 Policemen injured, 150 lawyers charged with attempted murder. Great to know the the purveyors of Law and Order have such a blatent disregard for the rue of law. I predict a riot . . It wont have escaped many people that yesterday was my half birthday! The other occasion that is celebrated is of course Valentines Day, although in India couples showing affection in public run the risk of being attacked. To counter this, a facebook group was created called “�The Consortium of Pub-going, Loose and Forward Women” which has of 42,000 members. They urged members to send pink underwear to the Sri Ram Sena. Genius. But despite this, there were attacks�on couples yesterday,�by these self styled ‘moral police’. In one instance, a man was forced to marry a donkey as an act of humiliating punishment for being seen in public with a woman. Still, there were instances of couples being forced into marriage or tie �rakhis.� In Ujjain, a brother-sister duo was not spared as some miscreants � claiming to be of the Bajrang Dal � mistook them to be a couple and beat up the boy. So happy Valentines everyone, hope you had a good one. Milk, Cheese, Egg, protein, wheat, cereals, peas, oranges, fish, chicken, nuts, chocolate, natural and synthetic additives, artificially flavoured articles, alcohol, pollen, dust, heat, fungi, antibiotics, cocaine, heroin, insect bites, fungal infection, deodorant, perfume, cosmetic products, washing powder, stress or just to cover anything else, it could be “idiopathic” – unknown. Great, that’s useful, really narrows it down. 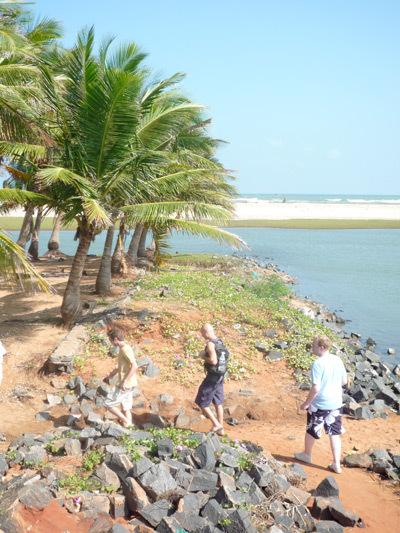 Formally known as Pondicherry, this ex-French town 200km South of Chennai is in fact its own state. As such, it has its own – more relaxed – alcohol laws. Initially we had planned to get a AC bus to Ponducherry, but my driver insisted he drove us down. We grabbed some fast food on the way down, titled our chairs back and watched DVD’s for the entire journey – well, when in Rome. The town is split into quarters, the most interesting being the French, where as well as colonial architecture you have policeman with red ‘kepis’, street names such as ‘Rue de la Marine’ and pain au chocolat served from cafes. And the only pictures I have from this charming Gaelic enclave don’t capture any of that at all. . . So, just like clockwork I am ill again, by my calculations next episode will be coming in on around the 23rd February, it will be wet, certainly windy and heading in a southerly direction. 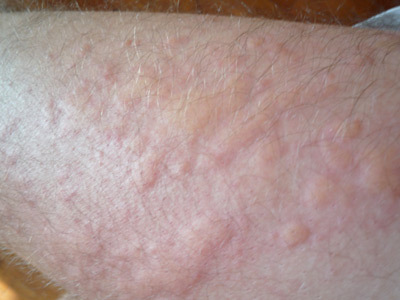 Not one or two – �one or two hundred if not more – and they f&*king itch!! It wasn’t a mozzi as i was under my net, even its either an allergy (i doubt) or some king of bug which had an party on me last night. Off to the vet now to get checked out. The Kingfisher beer out here has glycerine in, as a preservative in the heat. If you lower an open bottle upside down into a glass of water you can watch an oily film (glycerine) descend from the bottle as it is heavier than water. The effect of the glycerine after a relatively light drinking session is truly unbearable. I woke up on Saturday morning with the most banging headache I have ever had and to make things worse, I hadn’t bought any water recently so I had nothing to drink in the house. I think i will avoid drinking Kingfisher in future, but I have said that before! You are currently browsing the Nick Piper's Blog blog archives for February, 2009.